It’s been a few weeks since the events of Hockenheim, and the F1 drivers have had their break, and now it’s time to get back down the serious business of racing fast cars. Formula 1 returns, and heads for one of its most iconic venues. 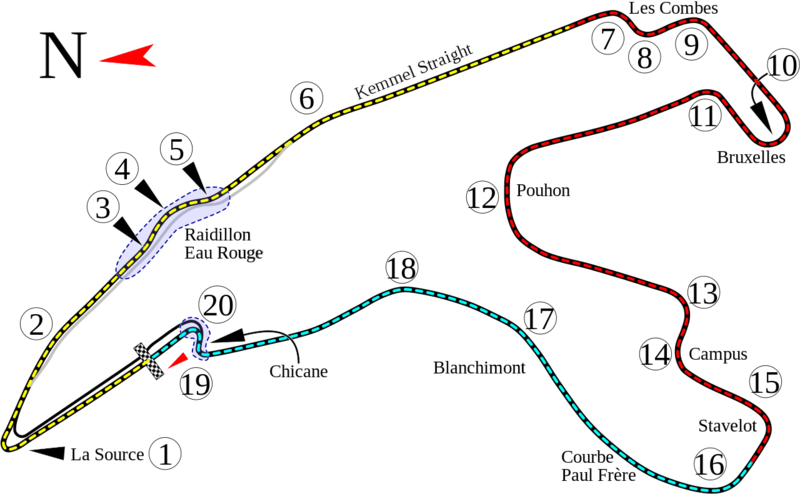 Spa-Francorchamps is a fearsome circuit. At one point (prior to F1) it was a 9-mile long race through the forests, and from 1946-1970 it was an 8.7-mile speed fest. Needless to say, Spa has historically been a dangerous track – 48 racers, across various formats, have been killed here, including as recently as 2013. Four marshalls have also died at Spa. The ‘new’ circuit (circa the late 1970s) is 4.3 miles and still incorporates a few elements of the original track. The legendary Eau Rouge is a fast uphill left and right-hand jink that always tests a driver’s nerves and skill, whilst the weather is famous for being erratic, with parts of the track being bone dry and other parts being wet. With parts of the track being winding, mid-speed corners and other parts being flat-out straights, car setup is not an easy thing to nail here. In the context of 2016, the season is at a crucial stage. Championship leader Lewis Hamilton heads Mercedes teammate Nico Rosberg by 19 points, having overturned a 43-point deficit. With Mercedes leaning toward changing engine parts on Hamilton’s car for the next race in Italy, the Briton will need to maximise his points at Spa in order to ease the pain of that penalty. Rosberg will be eager to regain the initiative, which has slipped away from him after a superb start to the season, however Rosberg has not won at Spa. The power aspects of the track will suit Mercedes, but Sector 2 in particular is a winding, twisty portion of the circuit that might play to the strengths of the Red Bulls, who have edged ahead of Ferrari in the constructor’s championship. RBR will be looking to make a nuisance of themselves once again in Belgium, having scored a double podium last time out.